‘Datchet’ as a place name is very old indeed. It derives from the Celtic language and in this area it is unusual for Celtic place names to survive. A Celtic (or British) language was spoken across Britain by the late Iron Age, before the Roman invasion in 43 AD. It is likely to have developed during the Bronze and Iron Ages, over 4000 years ago, and many modern river names are Celtic in origin, including the Thames. After the ruling Romans left and the Saxons arrived, most places became known by Anglo-Saxon (or ‘Old English’) names, except in the north and west of Britain where the old Celtic language survived. Until recently, the ‘cet’ part of the name has been assumed to mean wood or forest in Celtic but no derivation for ‘Dat’ has been suggested. Since there is no evidence for Datchet being a notably wooded place, this is not a very satisfactory explanation; but there is an alternative one. 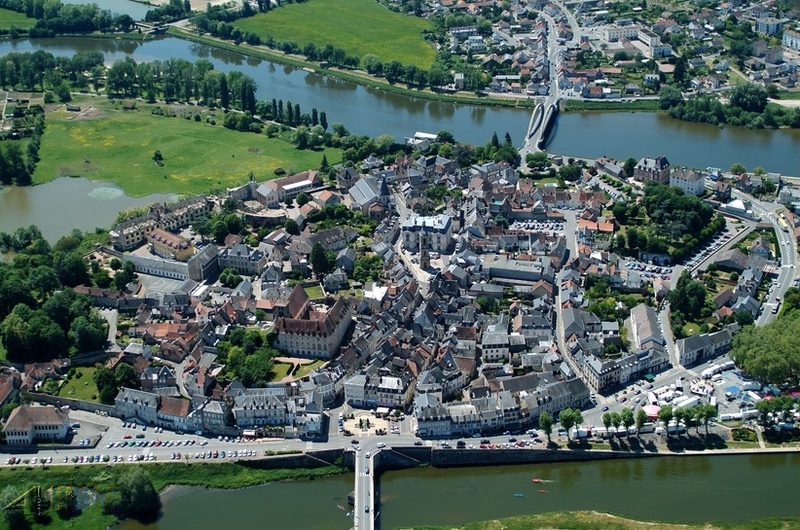 At a crossing point of the river Loire in central France, there is a town now called Decize (in ancient times Decetia), in an area occupied by the Decetiae tribe of Celtic Gauls. The account of Julius Caesar’s Gallic Wars in 52 BC (think Asterix here!) records that Caesar settled a dispute involving this tribe at their town on an island in the Loire. In 1982 the historian K. Rutherford Davis, in writing about Celtic place names, links Datchet (in Latin, Daceta) with Decize (Decetia). 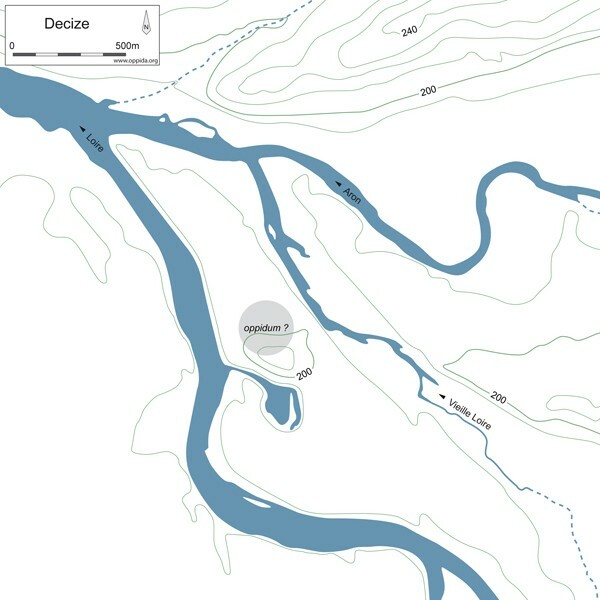 But Decize and Datchet have more in common than an unusual name; both were originally established on islands of high ground in the low-lying land of a major river route; the remains of Decize’s ancient fort is shown on the map as ‘oppidum’. Settlement sites like this are common, but it may still be significant that these two share such a distinctive name which is not found anywhere else. During Celtic times there was frequent movement across the Channel by British and European tribes and while it is impossible to say how or when the name travelled as well, this connection does seem to offer a plausible explanation for the puzzle of Datchet’s name. The fact that the two names are spelt differently is not a problem; spelling did not become standardised until relatively recently and if a word sounds like ‘Datchet’ then it really is ‘Datchet’. Variations found so far include: Deccet, Dachet, Dochet, Dechchet, Datchete and Datchett, depending on how individual scribes wrote the word that they heard spoken. There is no consistent change across the centuries and most people who lived here in the past would never have seen the name written down or thought about its spelling. What is most significant about the village’s Celtic place-name is the implication that it was a continuously inhabited settlement rather than being re-founded and named later by people who spoke Anglo-Saxon. The local archaeology supports this view. At Southlea Farm, on the way to Old Windsor, a group from the Village Society investigated a prehistoric site known from cropmarks which had been identified in aerial photos. No excavating was done, only a surface collection of flint tools and pottery brought up by the plough, but the results were very significant indeed. People had lived here in prehistoric times on an ‘island’ of slightly higher ground within the floodplain of the Thames’ Southlea loop. Plenty of evidence was found at the Southlea settlement from the Neolithic period, the Bronze and Iron Ages, to the Roman occupation (that is, from about 4500 BC to about 400 AD), but almost nothing to show that people lived there after that date, in the time of the Anglo-Saxons. Areas of land that were high enough to be habitable and safe from flooding became significant settlement sites for people living along the course of the Thames, which was a major route deep into southern Britain and quite densely populated in ancient times. 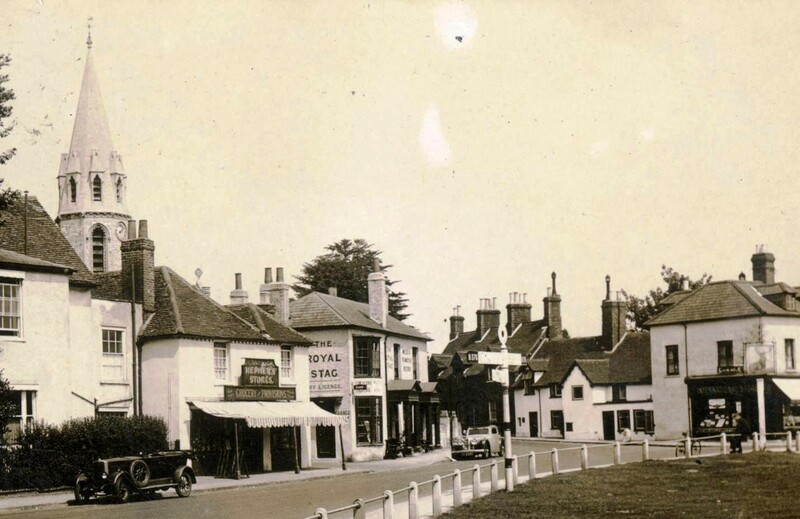 The village of Datchet, as we know it, developed around another high ‘island’ not far up-river from Southlea. This was the natural mound on which the church stands, still well above modern flood levels. It is only because no development ever took place at Southlea that its early settlement can still be identified and explored. 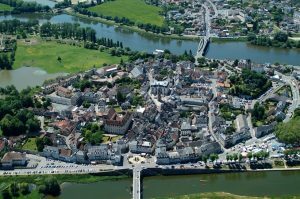 If, at the same time, people had been living on the site of the present village, later buildings would have obliterated their traces; but prehistoric finds don’t just come from the ground, there is also archaeology from the river itself. We can never know what people believed during the Bronze and Iron Ages, or who their gods were, but one of their ritual practices has left behind a wealth of evidence. In what seem to have been acts of symbolic sacrifice, prestigious swords, spears, and other weapons were cast into sacred rivers and pools as offerings to the gods. Folk memories of making these votive deposits survive in the story of King Arthur’s sword being thrown into the lake and in our urge to toss coins into wishing wells or fountains. 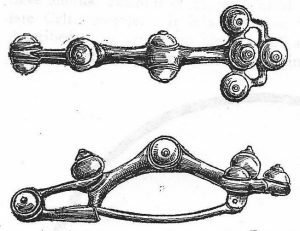 In particular, the river Thames attracted huge numbers of bronze and iron weapons which had been deliberately put beyond further human use or ownership until dredging boats brought them up to the surface again in the late 1800s. The boat operators knew these objects were of interest and value, so that many from the Datchet reach that were offloaded at the modern riverfront are now in the British Museum and the Museum of London, as well as in Windsor Museum. The finds from the Thames at Datchet, mostly of bronze, include: two swords (and a later one of iron); eleven spearheads; six axeheads; seven daggers; two knives, and one exceptional brooch. Further downstream, from closer to the Southlea settlement site, eleven spearheads and one iron sword were brought up. These bronze objects date from about 2000BC and the iron ones from about 800BC. Long ago the river banks were natural and the channel was much shallower so that the Thames could have been crossed on foot or horseback at a ford even before there was a ferry or bridge. There is one specific mention of a ford at Datchet: the Celtic brooch was recorded as having been dredged up at ‘Datchet Old Ford’ which was close to the site of the old Datchet Bridge directly opposite the end of the present High Street. 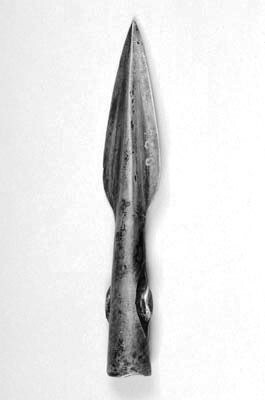 This remarkable bronze brooch (shown from above and from the side), was dredged from Datchet Old Ford (near the riverfront) in 1873 and is now in a collection at Eton College. It is about four inches long and decorated with seven amber and two blue glass beads, all still intact. It works like a modern safety pin and was used to fasten a cloak across the owner’s chest. Brooches of this period are commonly found, but this one is unique and must have belonged to a very wealthy person. It is Celtic in style and made around 100 BC, during the Iron Age. It could have been a votive offering, or was perhaps simply lost in the river. 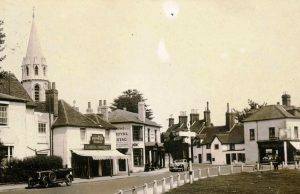 Datchet’s Celtic place-name implies that the village had been settled long before the arrival of the Romans and has been continuously occupied ever since. From the late 400s AD Germanic settlers (Angles, Saxons and Jutes) spread across the country, effectively replacing Celtic culture and language. Datchet kept its earlier place-name, but its inhabitants would have spoken Anglo-Saxon; the medieval field names which survive have their roots in Old English, or Anglo-Saxon. Datchet’s parish church, St Mary the Virgin, occupies the top of a roughly oval mound, almost certainly an ancient fortified site which was Christianised in Saxon times, as were many similar pagan sites. The earliest written evidence of Datchet’s existence is from 994 AD, during the reign of the Saxon King Elthelred, in a deed recording a dispute about land owned in Deccet by Wynflaed to be exchanged for other land in Berkshire belonging to Aelfric. Unfortunately, the deed contains no information about the place beyond its name. There would probably have been a timber-built church by later Saxon times, perhaps by the 800s. In William the Conqueror’s Domesday book of 1086, the description of the Manor of Daceta does not mention a church, but churches which are known to have existed in other places were often not listed. (The majority of English villages appear in the Domesday Book so Datchet’s listing there is not remarkable.) The provision of parish churches became the responsibility of Manorial Lords and by the 1150s the de Pinkeny family had probably rebuilt Datchet’s church in stone, although nothing visible survives from that date now. Some of the oldest buildings in the present village are clustered around the church’s high point, taking advantage of a safe refuge above the low-lying land to the south. The rise of the land is best seen from the car park behind the Royal Stag and from the foot of London Road by Church Cottage and James Cottages. If there had been Anglo-Saxon dwellings here, no traces of them would still exist, but some of the surviving late medieval houses were probably built on the sites of earlier buildings. As well as the church, they include: The Royal Stag (timber-dated to 1494); The Bridge; Old Priory (or the Rectory, where a house was built in 1376); and the early 1500s Church Cottage across London Road. One land deed related to this area in the mid-1200s refers to ‘land of the old court’ granted by Henry de Pinkeny, Lord of the Manor. This suggests that there was a Manor House (where manor courts were held) close to the church long before the present Manor House was built on the south side of the village from the late 1500s. One other piece of medieval evidence is a reference to John le Fysshere ‘of Bury Street’ who in 1394 acquired a house that was almost certainly on the site of the present Church Cottage opposite the church. The word ‘bury’ does not here refer to burials but in Anglo-Saxon meant a fortification or the centre of a town or a borough, as the church mound would once have been. ‘Bury Street’ could have skirted the foot of the high ground, passing in front of Church Cottage. It has often been suggested that Datchet is a subsidiary of Windsor, its existence depending on the Castle, but the village is older by thousands of years. At Old Windsor, a short distance downstream from Southlea, a prestigious Royal Saxon Palace was built by about 800AD on high ground in another deep loop of the river. Nothing remains of it now, apart from its site in a field called Kingsbury, because in 1070 William the Conqueror chose instead a much higher point on the other side of the Thames to begin building his ‘New Windsor’ Castle. From medieval times Datchet’s ferry boat was provided by the Crown as a fast, and sometimes secret, route from the Castle to the main London Road at Colnbrook, which was still in use long after Windsor’s town bridge had been built.